I just picked up an 88 165 I want to start prepping for SCCA's Rally Cross. I'm hoping to get some advice on set up options from someone with some rally cross experience. I'd like to start running the car in the stock category for the first year or two and then move toward the prepared category. The rules state that you must run a stock shock or non-adjustable stock replacement specifically made for the year and model. This restriction seems to greatly limit the options. What are you left with, KYB GRSs? Any suggestion on a good rally cross tire? Must be non-studded DOT tires. I'm in Portland OR so more than likely it will be muddy each time out. Need to be the same width and diameter as stock and with in 9.5 mm of the stock offset. Any other suggestions would be greatly appreciated. Here is a a copy of the rules if anyone would like to take a look. I do not rallyx my Alltracc that much but if you are in stock tire class get some Dunlap SP60s. The 165 trans iis also a better rallyx trans than the 185 due to the shorter gears. Stock rear shocks are still available I believe. That is probably a better option then GR2s. Funny, I just now saw this thread, as I have been doing the EXACT same thing. For stock class, the alltrac has a massive power disadvantage but a very slight weight advantage to newer AWD cars. That's not a big deal on smaller more technical and traction-limited events, but it's an issue that cannot be overcome within the rules (stock turbo, cat/dp, I/C, etc). Keeping stock wheel size is also hard, as finding 14x6 wheels is hard enough to begin with; finding 14x6 wheels any lighter than the stock wheels is proving to be very hard. Please let me know if you find anything. All the major Mfr's (TD, Kosai, etc) seen to make 14x6.5 or 7. All I seem to find are crap like these, which weigh more than stock and look hideous to boot. So far my search has been for other OEM wheels. Some such as Pontiac Sunbird and Sunfire as well as Dodge Dynasty, Aries, Lancer, Omni, Neon wheels are 5x100 and 14x6, with a 57.1 centerbore, but I cant find material type or weights on them (I suspect most are steel) so I may have to go junkyard hunting. I'm convinced that the single best thing to do is get some good tires on the stock wheels and "tighten the nut behind the wheel" You could also spend a LOT more money, bump up to prepared or modified class and try to be competitive there. I was seriously considering the later initially, but determined I already have too many (modified) cars and the competition is stiff. Hate to say it, but there are super-light and much more competitive cars off the bat in AWD modified class (a la 323gtx, etc). Stock is going to be most reliable, so... you know the rest. WideFNopen wrote: I do not rallyx my Alltracc that much but if you are in stock tire class get some Dunlap SP60s. Or snow tires, which are also acceptable for stock class. Too bad ws50's are sold out at tirerack. i run stock class in rallyx with my corolla. (though not scca, just local organizations in WI) talk about underpowered!! i use blizzak ws50s and they work great. ive wanted to build it and run in modified really bad, but i also have too many projects in the works (one of wich is a camry all-trac) i have been diong pretty good against old audi 4000's and 90's as well as 2.2l imprezas, so theres still hope! I didn't know SCCA had a Rally class. That's awesome. What is the stock offset of alltrac's wheels? What would be a ideal setup for stock class, are stock struts better then GR2's and what Springs would be ideal? I also want to know the BEST DOT Street winter tires I can buy, or damn near the best. Where can I purchase a Ski-Rack that will fit the alltrac? Summit Racing has Hella 500's which as far as I know directly replace the stock fog lights that are originally on the 165, and they are around the $70 mark for a pair. Also I'm in search for some sort of protection for the oil sump/engine block/gearbox/everything that's underneath and sensible ! 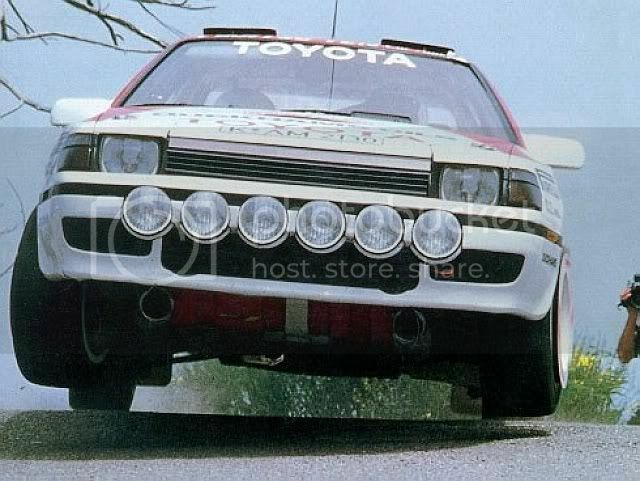 There is/was a member on here that made reproduction copies of TRD ST165 chassis rally preperation specification manuals....cant remember the members name or the thread where he advertised it at but Im sure someone here does. If you want the car to last the single best thing you can do to the car is strengthen it for rally abuse. Full roll cage, stitch weld the unibody, skid plates and metal plate re-enforcement in the wheel wells and strut towers. As for performance, get a really good clutch like nothing less than a STG4 kit, a downpipe with straight through exhaust and already mentioned good tires. I remember the guy with the manuals worked for ToySport, but I also forgot his name. I have been trying to get a hold of these for a while now. There is another thread about it that I bumb every now and again. I have had 3 others (non-alltrac.net) contact me after seeing that thread from a google search on them. If anyone comes across these manuals please let me know,Thanks! allblackalltrac wrote: mind posting that link? It was in the FS section and had a title something like TTE Build manuals or something. The guy was selling nice copied and bound manuals that he was making himself. I think the price was sixty bucks or so. I have tried to contact him and no luck as of yet. With that thread dissapeard I also lost all the contact info I had..that sux!